The Very Very Special Flower Basket has been exclusively made for the very very special person in your life. 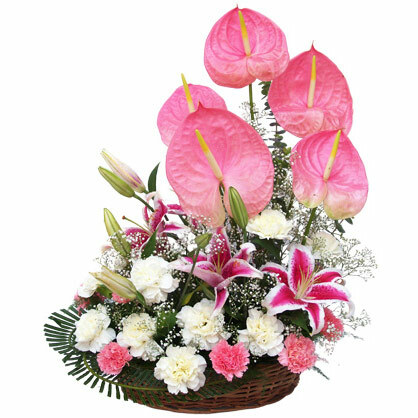 This lovely flower basket consists of very 12 pretty pink and white carnations,3 lilys,5 anthurium flowers which are beautifully arranged with greenery by our expert florist. This delicate flower basket is a valuable gift for any occasion; festivals, retirement, birthdays, weddings and anniversary. The pink and white flowers make good graduation and congratulation flowers too. You can also send the Very Very Special Flower Basket with get well soon wishes.